Stu is a retired firefighter with 31 years working for the Anne Arundel County (MD) Fire Department. Widowed when he met Donna, they married in April 2009 and currently live and travel in a 41' KZ Escalade toy hauler fifth wheel pulled by a medium duty Freightliner. Stu rode motorcycles in his younger years but took a long hiatus until purchasing the initial Big Red, a 1998 Harley-Davidson Electra-Glide with a Champion Trike conversion. He rode Big Red for several years before moving up to the current Big Red, a 2009 Harley-Davidson Tri-Glide. Eventually he traded in for a new 2012 Harley-Davidson Tri-Glide (Big Red #3), gaining some improvements from the earlier model. Fast forward to 2014 and one more trade (along with my 2011 Super Low) and a 2015 Harley-Davidson Tri-Glide aptly named Black Cherry. Donna is a retired IT worker with over 30 years in the industry, from programmer to management. She learned to ride at age 55 when her now late husband was diagnosed with cancer. 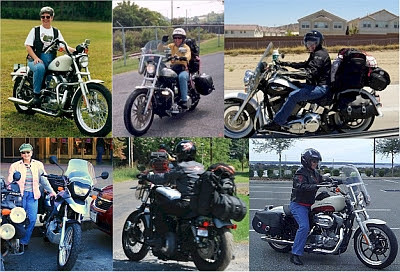 Widowed in 2004, she traveled the country solo in 2005, riding 27k miles through 42 states on her 2005 Harley-Davidson Softail Deluxe. In 2007 she sold her home in Sparta, TN, bought a used Fleetwood Tioga Class C motorhome and hit the road with her 2006 BMW F650GS. She had sold the BMW when she met Stu in July 2008 and has since moved back to a Harley-Davidson ride. After riding Rt 66 the fall on 2013, she knew that was her swan song for riding. Balance, strength and vision were worsening with age. In the fall of 2014, she opted to trade in her final bike along with Stu's 2012 Tri-Glide and bring home Black Cherry, the 2015 Harley-Davidson Tri-Glide.